DIRECT MAIL MARKETING - The Dinosaur of the Digital Age … or Not?! The Dinosaur of the Digital Age … or Not?! Having been born and raised, plus conducted much of our professional careers in the pre-digital era (no smart-aleck remarks, please) … i.e. 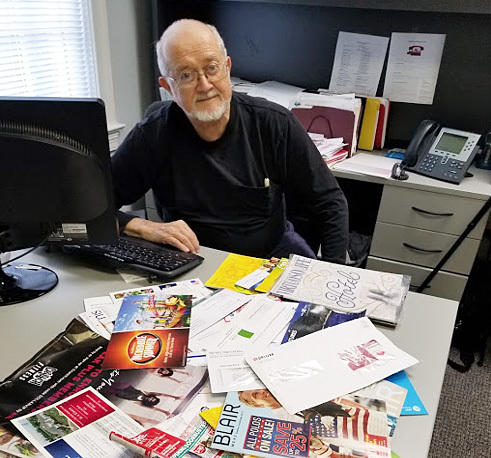 before websites, SEO, PPC, email, blogs and webinar invites … we wondered if the old-fashioned world of direct mail marketing is now a thing of the past. That led to some research on this marketing medium and our initial findings appear directly below. What you see is just one week’s worth of mailbox stuffers with a net weight of 7 pounds! The sheer saturation of digital advertising. Consumer preference for printed media. An apt analogy when it comes to digital advertising overload is that of taking a drink from a fire hydrant. We are inundated with literally thousands of ads every day … with some estimates reporting hundreds presented to most Americans before their morning coffee. And U.S. internet users (virtually everyone!) have a healthy sense of self-preservation when it comes to being bombarded with ads each time they log on. The first line of defense is to ignore the promotional intrusion. A digital marketing rule of thumb appears to be that maybe two percent of ads deliver on the promise of having actionable impact on consumers. Here’s a blockbuster illustration of that very point. As reported by the Wall Street Journal, Facebook Inc. announced that over a two year period, it had overestimated by up to 80% the average time people spent watching video ads on its platform. Hmmm … sounds like a defensive move by consumers and a major marketing budget blow to advertisers. Bottom-line is that impatience with internet interruptions spawns diminished attention spans. That means heightened inattention to the distractions of pop-up ads, banners and video intrusions … read, increasingly ignored. Reports like the article referenced above underscores a major kick in the teeth to advertisers who are ponying up significant marketing dollars. Likewise, consumer credibility has taken a major setback as well. Consider one channel alone, social media. The average person spends a couple of hours every day on one or more social media sites … and is hammered by ads. Now couple that with the relatively inexpensive way for marketers to gain exposure to millions and we have a landscape littered with questionable claims and dubious deliverables. Again, Americans on the internet are not stupid! And they demonstrate that by increasing skepticism of advertising in the digital world and the torrent of clickbait solicitations. Now here’s where statistics tell the story. 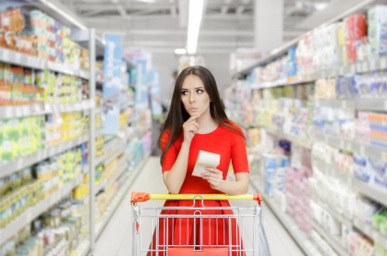 A Nielsen consumer survey report on advertising found that catalogues and flyers have the highest impact on people’s buying decisions with 62 percent of respondents rating them highest. That’s in contrast to only 12 percent preferring online ads. Millennials pay more attention to print. About half of this, the largest single generation in the U.S., says they ignore digital advertisements, while only 15% say they ignore direct mail. Print ads are perceived as more reliable and engender a significantly higher response rate. Purchase decisions are prompted by print ads. Print is considered a more trustworthy and authoritative source of information and enhances confidence in product and service offerings. Additionally, print ads give folks time to think … even if that results in it being trashed, it did receive attention and conscious consideration … unlike the unthinking impulse to hit the delete key. Now to sum up, take a few minutes to review the following infographic produced by Marketing Profs. “Contrary to popular belief, advertisers will be using direct mail marketing even more in the future,” says an infographic released by the Experian Data Quality group. 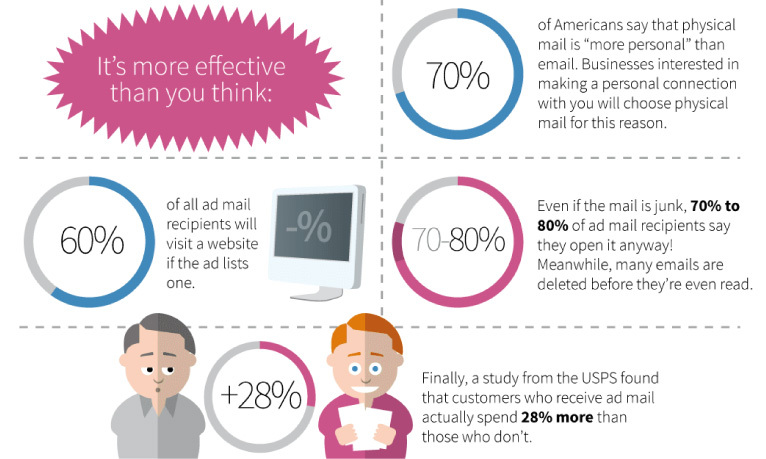 Some 70% of Americans say physical mail is “more personal” than email. Neiman Marcus says it makes four dollars for every one dollar it spends on creating and mailing catalogs. If you’re thinking of exploring direct mail, or if you just want to see some of the benefits and challenges of the practice, check out the infographic. Tap or click on it to view a larger version. Research shows that direct mail is steadily making a comeback.